I’ve switched to standing at work for a few years and I’ve used some different standing desks, including a bike desk and some tabletop standing desk converters. They all are good for its job but they don’t have the flexibility that I always want from an electric motorized standing desk. However, those standing desks are out of my budget; a simple configuration can easily cost you more than $500. That’s the reason why I was very surprised when checking out some standing desks from Autonomous. Their pricing starts at just $299 plus shipping. I got the higher-specced SmartDesk 2 Business Edition and it still comes with an inexpensive price tag of $449. The product comes in 2 separate pieces, one for the table top and one for the sit-to-stand frame. It took me nearly an hour to unbox and put them all together. Fortunately, the user manual has very detailed instructions to help me assemble the desk faster. It’s not that easy to change our habit from sitting to standing when working. In the first month, you might feel uncomfortable and even see a decrease in productivity. However, once you get used to it, you will be thankful that you made the change. By using a standing desk, I don’t mean you have to stand all day while you work. Sitting for a long period of time will increase heart failure risk and it is associated with obesity, cancer, and metabolic syndrome. However, extended standing doesn’t make you healthier. It can cause pains on your back or legs, and increase the hospitalization risk of varicose veins. So, the key is to find the comfortable balance between sitting, standing, and moving around. 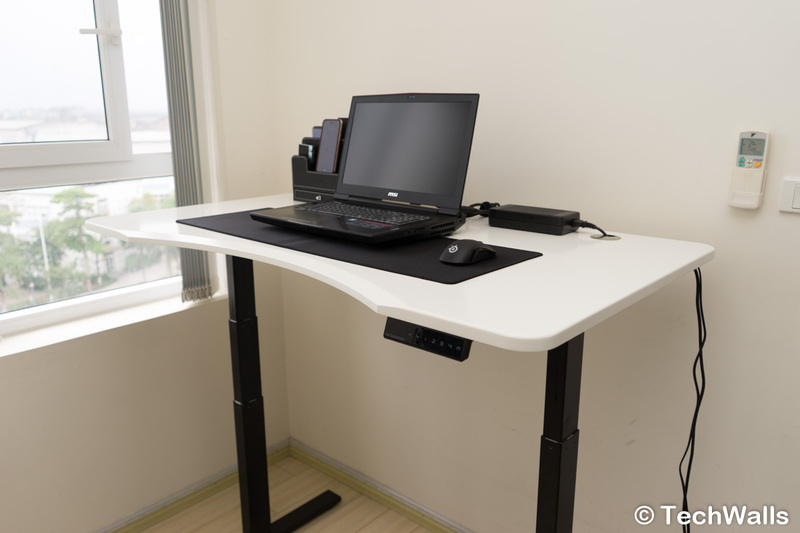 It is very inconvenient if you want to make the switch between sitting and standing if you are using a tabletop standing desk converter. It takes a lot more efforts since you have to move your computer and other stuff off the standing desk, put it away, and then place your computer on your desk again. The process is cumbersome and most people don’t want to do it, so they don’t make the switch that often. With an electric standing desk, changing from standing to sitting is just one button press away. 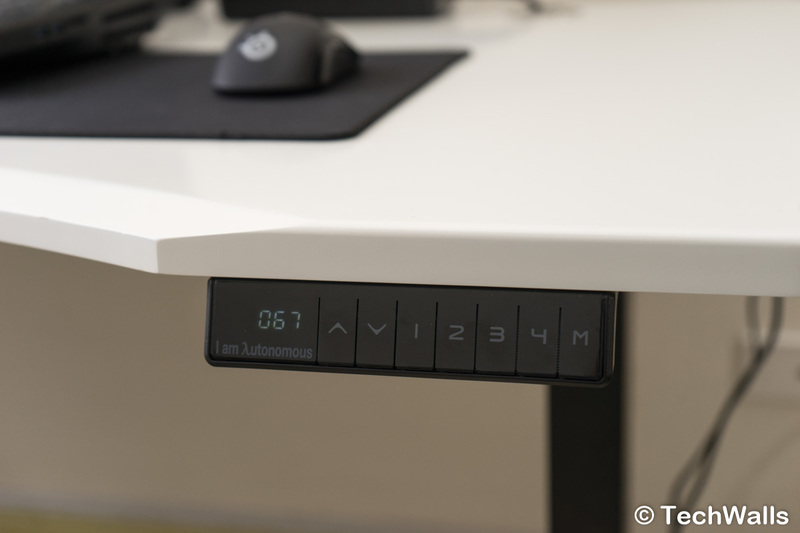 The Autonomous SmartDesk 2 allows me to adjust the height electronically. There is a control on the right side; you can adjust the height manually with the up/down button, or save 4 different height positions so that you could change the height faster. For example, I save the 1st height for the lowest position, the 2nd height for my sitting position, the 3rd height for my standing position, and the 4th height at the highest level. I love that the settings are stored in the memory, and I don’t have to set up again even after I pull the plug. When I need to change the height, I just need to press momentarily on the memory preset buttons, then the whole desk will move up/down smoothly like magic. On the left side of the control, you have a display showing the current height of your desktop. As compared to the Home Edition, the Business Edition has some upgrades like the dual motor on two legs, a wider height range from 24″ to 51″, a load capacity of 300 lbs, and a 5-year warranty. You can see that there are two actuators hidden under the desk, they are connected to a control box. An advantage of the engines is that they run very silently. In a normal condition, the sound level of my office is 30db and it increases to just 43db during movement. 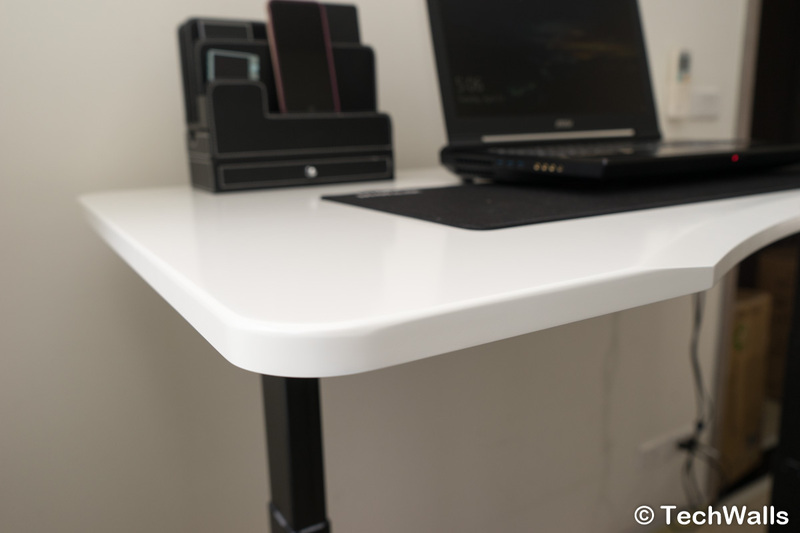 I really love that the SmartDesk 2 has a very sturdy build quality. The frame and the table top are fairly heavy at more than 110 lbs in total. The table top is so spacious that you can easily place 2 monitors next to each other. Specifically, it measures 53″ x 30″ but you can also upgrade to a longer top measuring 70″ x 30″. It also comes in some different shapes, mine has a curve design. The top has 2 cutouts near the back to help route cables; you can turn them into a wireless charger, USB charger and speaker by purchasing an accessory kit. A common issue of standing desks is that they wobble excessively when we are standing and typing. I was afraid the SmartDesk 2 could have this issue as well because of its 2-leg design, fortunately, that’s not the case here. My monitor still vibrates a little bit but you will hardly notice it. To test how stable the desk is, I placed a glass of water on the desk and kept typing. You can check out the video review to see its performance. The best practice of using the standing desk is combining between sitting, standing and short break. For instance, I sit for 30 minutes, stand for 20 minutes, and take a short break of 10 minutes for every working hour. Standing feels great when I write emails responding my clients, read the news, or do photo/video editing. On the other hand, I still need to sit when I need to concentrate on doing more focused tasks, like writing an article or finding new ideas for my business. 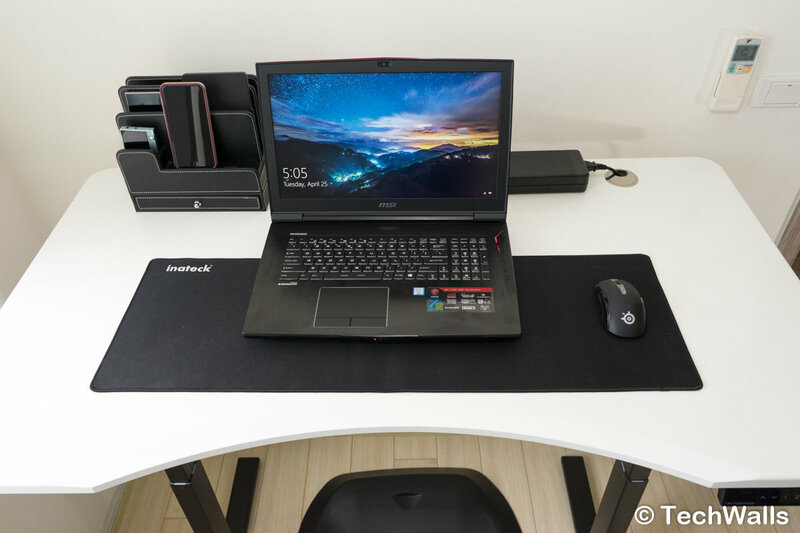 Besides, you should use a standing mat like the Ergodriven Topo anti-fatigue mat that I’m using right now; it will effectively reduce upright stress on your legs, back, and hips so that you can stand a little longer. If you are in the market for a motorized height-adjustable desk, the Autonomous SmartDesk 2 Business Edition is a decent choice. 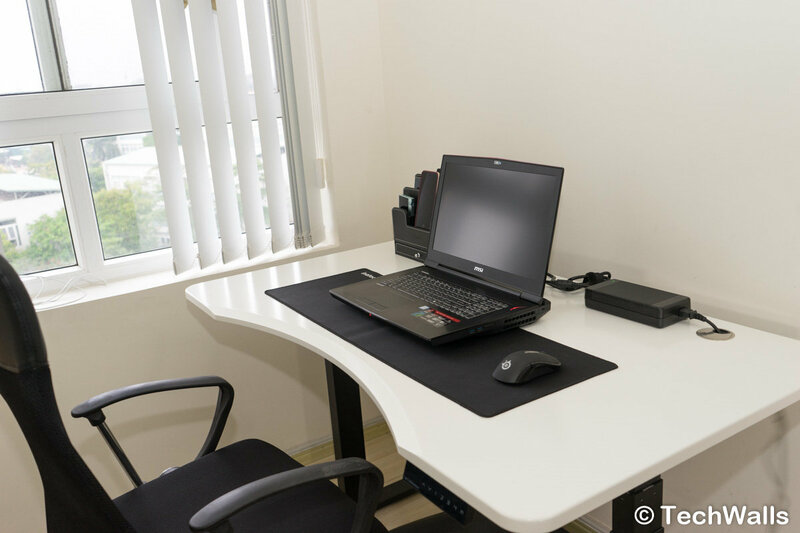 It could help you switch from sitting to standing position effortlessly, and you will soon see the benefits of the working style. 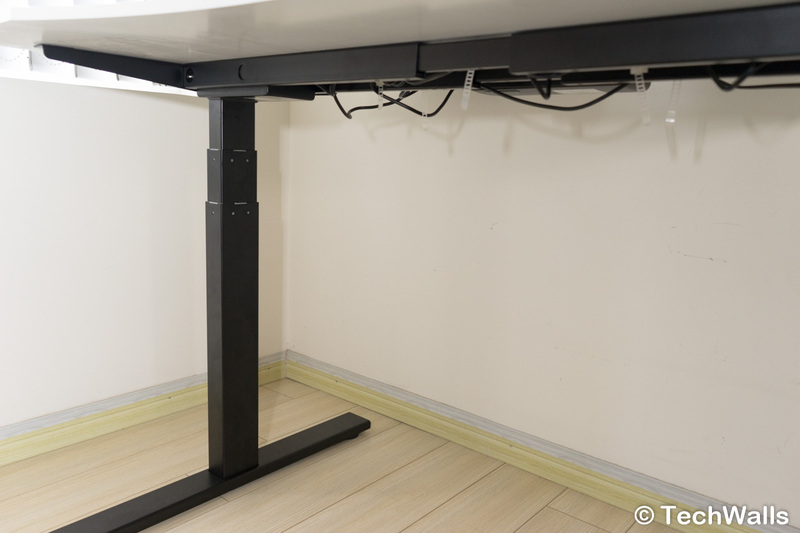 The standing desk has a solid build while the price is still very reasonable. We at TechWalls highly recommend the product. A high-quality motorized standing desk for a reasonable price tag.